New Research Shows Foundations for Growth of European Industry Initiative that Gives Consumers Transparency & Control over Advertising Choices. Awareness of the OBA Icon has Doubled in Britain and 1 in 25 European Consumers Have Visited the Your Online Choices website. Brussels, 18 December 2014 – A new online study commissioned by the European Interactive Digital Advertising Alliance (EDAA) and TRUSTe, leading data privacy management company, has revealed that awareness of an icon aimed at providing greater transparency and control over behavioural advertising has doubled in Great Britain and, in just two years, the EU Self-Regulatory Programme underpinning this has achieved recognition and engagement. 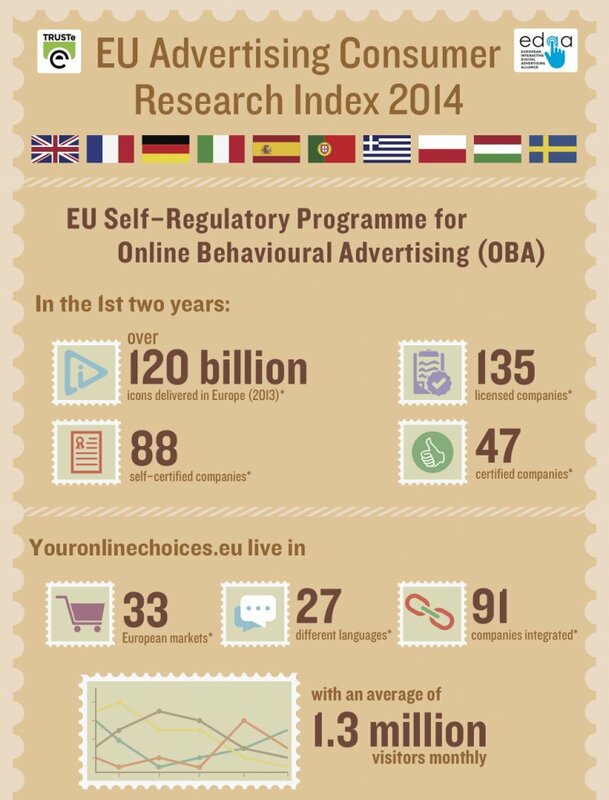 The European Advertising Consumer Research Index 2014 provides a comprehensive picture of attitudes and awareness of the EU Self-Regulatory Programme across Europe. The study was conducted by Ipsos MORI, on behalf of TRUSTe and the EDAA from 21 October – 10 November 2014 with over 10,000 respondents across 10 different European countries. The countries chosen — Great Britain, France, Germany, Spain, Portugal, Italy, Greece, Hungary, Poland and Sweden — were selected based on range of geographic spread and current implementation status of the EU Self-Regulatory Programme. An EDAA consumer awareness campaign took place in Greece in 2014 and one in Sweden had just commenced when the research was conducted. Comparison data is available for certain findings from Great Britain where TRUSTe commissioned comparable research carried out by Harris in 2012 and 2013. The results show that awareness of the icon continues to rise in Great Britain with awareness increasing from 13% (2012) to 22% (2013) to 26% (2014) over the last two years and that the EDAA’s 2014 consumer awareness campaign provided a significantly greater level of awareness in Greece, where 39% of respondents are familiar with the icon. Among those who have seen the icon in Sweden and Greece, around 1 in 3 (both 32%) have chosen to find out more by clicking on the icon, with this figure rising to around half in Spain (49%). The Programme has been shown to have the potential for a positive effect on attitudes too, with 54% in Portugal more favourable towards the idea of online behavioural advertising if they have information about how adverts are delivered to them online and the option of managing their privacy preferences. • 1 in 25 respondents aged between 18-50 in the ten markets surveyed say that they have visited the www.youronlinechoices.eu website. • Across the ten countries, the majority (57%) of 18-50 year olds who report they have visited www.youronlinechoices.eu correctly believe its primary purpose is to provide instructions to manage their advertising preferences. • The Programme has the potential to improve consumer attitudes with 54% of respondents in Portugal saying that having the option of managing their privacy preferences and information about how adverts are delivered to them online would make them more favourable towards behavioural or interest-based ads. “The results of this year’s European Advertising Consumer Research Index show foundations for growth of this important European self–regulatory initiative that gives transparency and control over advertising choices to European consumers and is achieving increasing recognition and momentum amongst the industry and regulators.” said Chris Babel, CEO, TRUSTe. A copy of the research infographic are available here. Data were weighted to the known population profiles for each country. 125 adults questioned in Spain, 395 in Greece and 136 in Sweden reported that they have seen the icon. Across the ten countries, there were 7,417 18-50 year olds interviewed, with 326 18-50 year olds reporting they have visited www.youronlinechoices.eu. Comparison data is included from research conducted online by Harris Interactive on behalf of TRUSTe between 12-19 June 2013 among a total of 1,254 UK internet users, aged 18 and older from 31 May to 6 June 2012 among a total of 1,027 UK adults aged 18 and older. The online surveys were conducted using the Harris Interactive Online Consumer Panel.